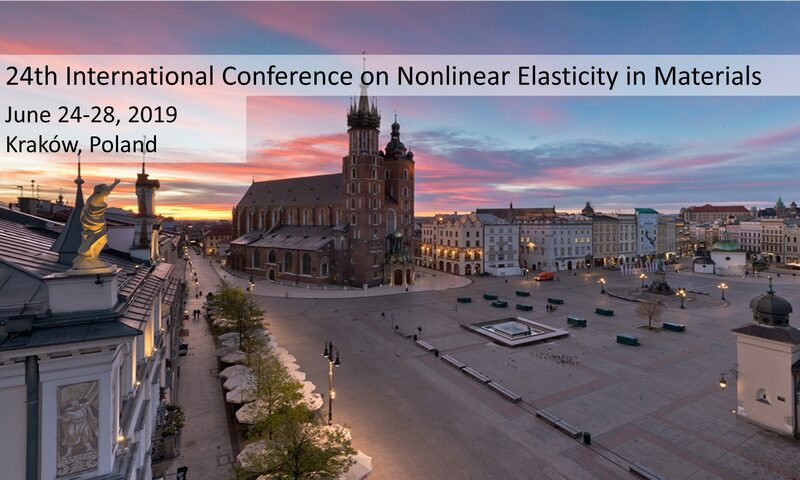 The purpose of the yearly International Conference on Nonlinear Elasticity in Materials (ICNEM) is to promote understanding regarding the elastic nonlinear behavior of solids. The primary manifestations of the behavior are characteristic wave distortion, and slow dynamics, a recovery process to equilibrium that takes place linearly with the logarithm of time, over hours to days after a wave disturbance. The link between the diverse materials that exhibit nonequilibrium dynamics appears to be the presence of soft regions, thought to be primarily ‘damage’ at many scales, ranging from order 10^-9 m to 10^-1 m at least. The regions of soft matter may be distributed as in a rock sample, or isolated, as in a sample with a single crack. The precise physical origin of the behavior is clear in some cases such as granular media where the source of the nonequilibrium dynamics, grain-to-grain interaction, is well understood. In other materials, it appears that the origin must be due fundamentally to shear sliding, related to crack and possibly dislocation dynamics, as well as less clear origins. Because the physical origins of the behavior are related to damage, damage diagnostics in solids, nonlinear destructive evaluation follows naturally. Nonequilibrium dynamics also plays a significant role in other areas such as earthquake strong ground motion and potentially to earthquake dynamics. The ICNEM is focused on a class of materials that exhibit nonlinear elastic behavior including nonlinear stress-strain relationships, nonequilibrium dynamics, discrete memory, and hysteresis. A vast number of materials fall into this class: e.g., rocks, concrete, damage solids, unconsolidated granular media, bones, and wood. The conference is of fundamental importance to develop new theoretical descriptions of nonlinear elasticity and to developing applications. To date, applications include faulting and tectonics, non-destructive evaluation of materials, granular physics inducing fault zones and avalanche, and to porous media uptake of fluid. There is no other scientific meeting in existence that unifies these topics in this manner. We intend to bring together internationally recognized scientists who will present newest developments in this field but also students, post-doc, and junior researchers who will experience a crash course on this topic. Eminent scientists in the field will animate the lectures and workshops. These scientists include Koen Van Den Abeele (Catholic Univ of Leuven, BE) | Guillaume Renaud, Sylvain Haupert (Univ Pierre et Marie Curie, FR) | Marco Scalerandi (Politecnico di Torino, IT) | Yoshikazu Ohara (Tohoku Univ, JP) | Lukasz Pieczonka (AGH Univ of Science and Technology, PL) | Cédric Payan (Aix-Marseille Univ, FR) | Paul Johnson, TJ Ulrich, Jim Ten Cate, Pierre-Yves Le Bas, Marcel Remillieux (Los Alamos National Lab, US) | Lev Ostrovski (Univ of Colorado, US) | Parisa Shokouhi (Penn State, US) | Michel Campillo, Jacques Riviere (ISTerre Grenoble, FR) | Rob Van Der Hilst (MIT, US) | Robert Behringer (Duke Univ, US) | Karen Daniels (North Carolina State Univ, US) | John Popovics (Univ of Illinois, US) | James Langer (Univ of California Santa Barbara, US) | Robert Guyer (Univ of Nevada, US) | Jan Carmeliet (ETH Zurich, CH) | Vladislav Aleshin (CNRS, FR) | Yehuda Ben-Zion (Univ of Southern California, US) | James Rice (Harvard Univ, US) | Vincent Tournat (Univ du Maine, FR). Proceedings are published in POMA of the ASA.